Atrocities of occupying state pakistan’s forces in Balochistan continues as another Baloch,also a tribal personality gone missing for the second time. Gul Khan Marri, a tribal elder abducted by the pakistani forces Kohlu area of Balochistan during a military operation in past days. it is the second time of Gul Khan marri getting abducted in the hands of pakistani forces, he was abducted by forces in Mussaraf’s dictatorship era also but released after a year of extra-judicial detention. Occupied Balochistan:The Pakistani secret agencies and Frontier Corps (FC) abducted another Baloch namely Wazeer Reki from Mashkel town of District Kharan in Balochistan.According to the reports Pakistani secret agencies and Paramilitary force FC has abducted the Wazeer Reki on 25th November in early morning hours. Wazeer Reki was on his way back to Mashkel Town ,when unknown plain-clothed armed men along with Frontier Corps (FC) stoped him and after checking his Identity Card the forces whisked him away from the scene.According to the eye witnesses the abductors also beaten up the Wazir Reki on scene of abduction. Wazeer Reki’s family while speaking to local journalists said that six days ago Pakistani secret agencies also abducted the Wazeer Reki’s nephew Abdul Hameed Reki.The family members further said that Wazeer Reki and Abdul Hameed Reki are not in politics ,neither affiliated to any political party.The family members are concerned about the whereabouts of Wazeer Reki and Abdul Hameed Reki.The family also urged the United Nation and other International human rights organizations to help recover their loved ones. Seprately the family members of Haji Gul Khan Marri said in a statement that Pakistani forces has abducted the Gul Khan Marri during a search operation in Kohlu after Chamalang incident.They further said Gul Khan Marri is a tribal and social personality of Kohlu,and he is not affiliated to any political or armed group.Gul Khan Marri was once before abducted and disappeared for one year during Pervez Musharaf’s Military era.The family appealed to the judiciary and human rights group to play their role in safe recovery of Gul Khan Marri. In so called search operation in Chamalang and Kohlu area ,morethan 30 Marri Baloch were abducted by military and their whereabouts are still unknown.The ISI sponsored organisation led by SirajRaisani Tehreek Nefaz-e-Aman in a statement in local newspapers claimed abducting 30 Baloch from Chamalang,but who were actually arrested by FC. It should be noted that Pakistani forces have forcefully disappeared nearly 14,000 Baloch including 168 women and children since 2000.In last 14 months morethan 300 Baloch student,political activist,writers,journalists,lawyers and teachers killed in Pakistan military custody,and their bullet riddled bodies found from roadsides and mountains. 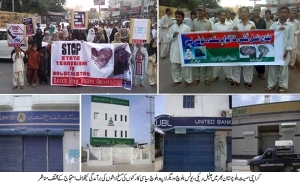 Occupied Balochistan: A complete shutter-down strike was observed in many areas of Balochistan on Friday in protest against the killing of Baloch Republican Party (BRP) Central Information Secretary Jalel Reki and Baloch National Movement (BNM) activist Muhammad Yunus. Their bodies were found in Aap Sar area of Turbat on Tuesday. The strike call was given by BRP and was supported by BNM and various other student organisations. All shops, markets, commercial establishments, banks, pharmacies and restaurants remained closed for the day. Traffic was thin on the roads as people preferred to stay within their houses in support of the strike call. 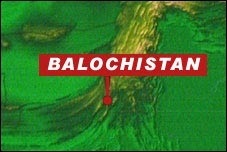 Routine life in major parts of Balochistan remained paralysed on Saturday. Strikes were also observed in Panjgur, Gwadar, Turbat, Pasni Jiwani, Ormara, Mastung, Mongechar, Awaran, Tump, Hoshap, Mand, Buleida, Khuzdar, Surab, Kalat amd Dera Allah Yar. Political leaders and parties issued statements to newspapers condemning the killing of missing persons while in custody. No untoward incident was reported from any part of Balochistan during the shutter down strike. Karachi: BHRO (Baloch Human Rights Organisation) have organised a protest demonstration in front of Karachi Press club against the extra judicial killing of BRP leaders Jalil Reki and BNM activist Mohammad Younus Baloch. A large number of Baloch women and children also took part in the protest to condemn illegal abduction of thousands of Baloch political activists by Pakistani security forces and extra judicial killings under-custody. The protestors chanted slogans against Pakistan and its security agencies for the ongoing atrocities against Baloch people. They also strongly condemn the collusion between Iran and Pakistan while terming it a systemic joint war against Baloch people by both occupying states. They said that Iran and Pakistan were violating international human rights and war laws. They charged the both state are involved in killing innocent and unarmed civilians in Balochistan whereby violating all basic human rights of the Baloch people. They urged the freedom loving Nations around the world and International Human Rights Organisations to take notice and condemn [Pakistani] state terrorism in Balochistan. “Help the Baloch in their struggle for freedom and world peace”, they said in their concluding remarks.